What are these numbers? 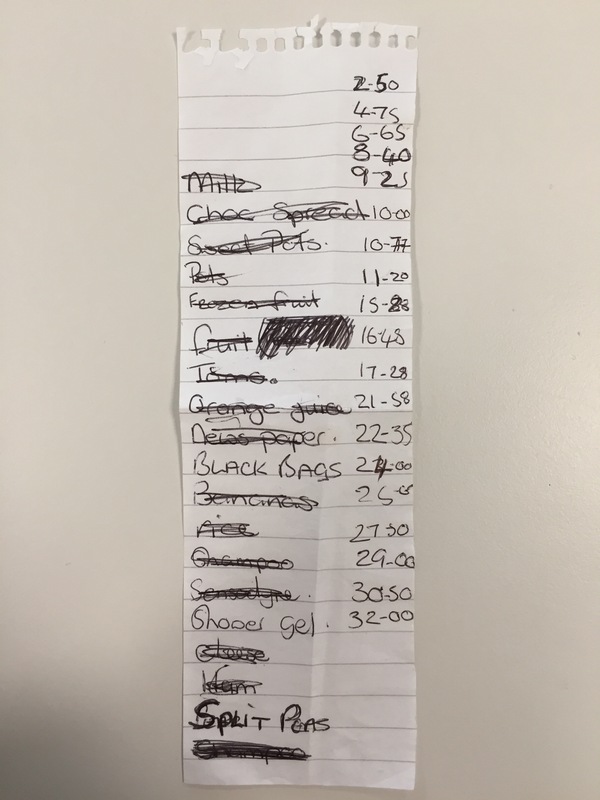 This list was found by Steve and he thinks they could be a running total of the prices. What else do we know? This list was taken from a spiral bound notepad which has been cut vertically. The list was written by more that one person, compare BLACK BAGS with Bananas, not only capitalisation but also a difference in the Bs. This person is a crosser offer. They have bought no meat, a vegetarian? Actually there is some ham near the end. Milk, choc spread, sweet pots, pots, frozen fruit, fruit, toms, orange juice, newspaper, black bags, bananas, rice, shampoo, sensodyne, shower gel, cheese, ham, split peas, shampoo. Found by Steve in Sainsbury’s in Tadley. This could be a classic tagine, any cooks out there, please correct me if I am mistaken. Tomatoes, chicken thighs, sugar cubes, chicken (coacoo)?, salad, toms, Avacado, mixed herbs, paprika, honey, ground cumin, onions, apricot. I guess this person works for Knight Frank or they are buying or selling a house with them. Cat owner. What is Nub? Rice krispies, shreddies, cat food x 2, coffee 37 x 3, veg, yoghurt, lacto free (not sure what), nub, bananas and kiwis, bread. 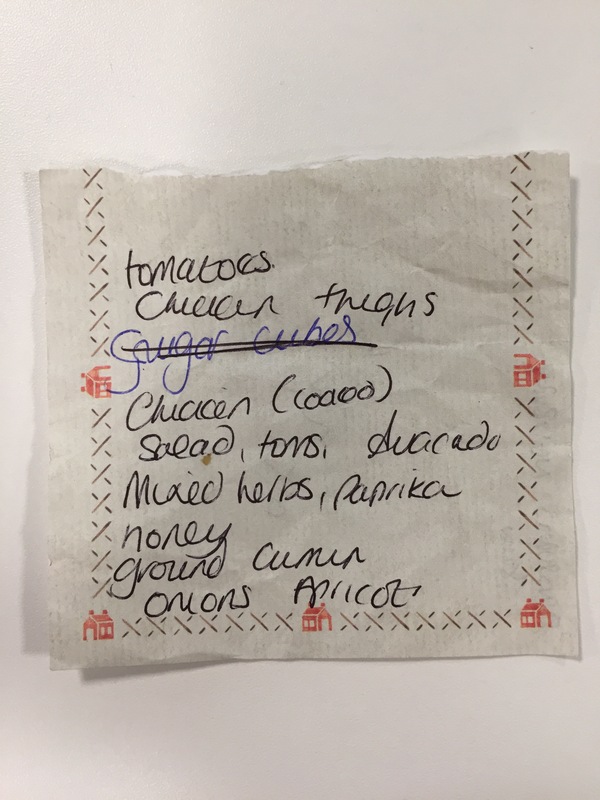 Found by Angela, Waitrose, Basingstoke. 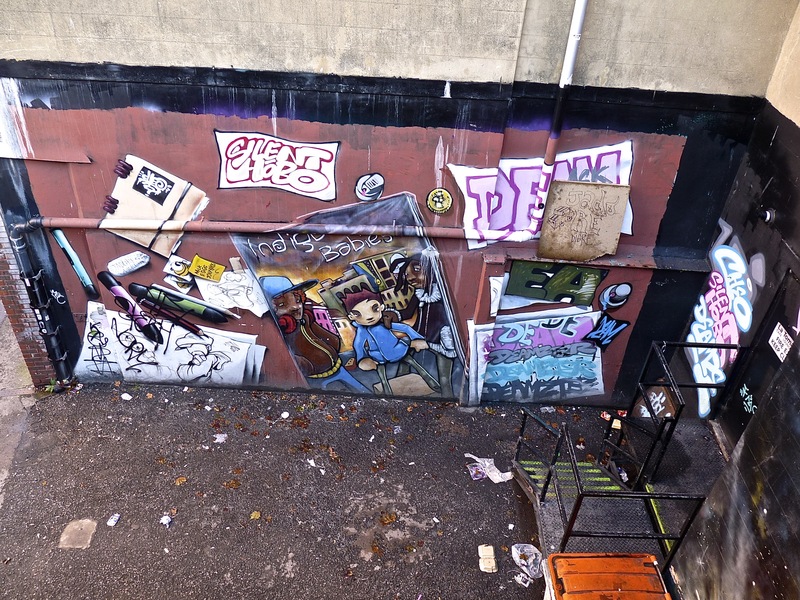 I went to Bristol at the week-end and found this colourful list on some street art (viewed from the bridge on Park Street towards the Hatchet Inn) – don’t know if its within your rules, but I would love to know more about the person who wrote it. I don’t know what Joey Bags are – on a Google search they could be 1. handy-sized plastic skips, 2. man-bags aka Joey from Friends or 3. recycled tweed bags designed by Joey D – 4. It could be the slang name for artist himself. Although I think that he is Silent Hobo (one of three Indigo Babies pictured – probably the one in the hat). This person is a crosser-offer, it seems all items were obtained bar the first two. 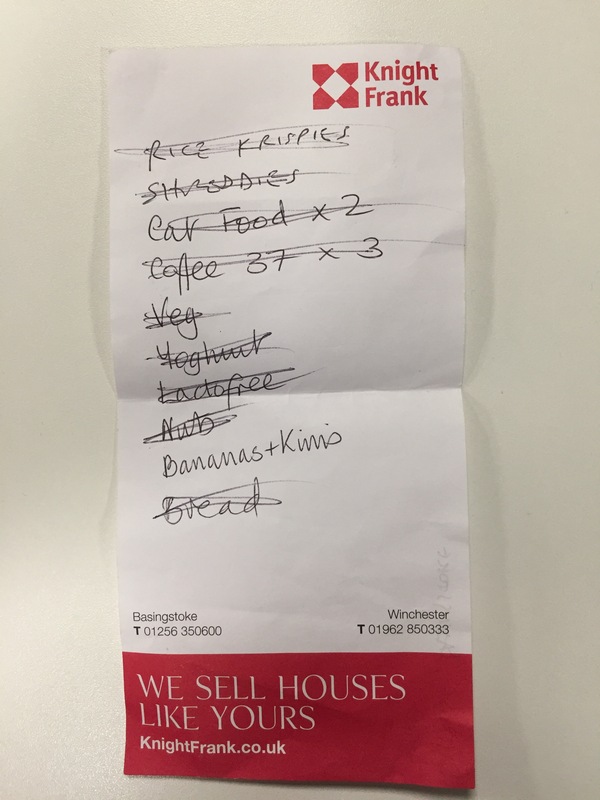 No vegetables on this shopping list but plenty of fruit. 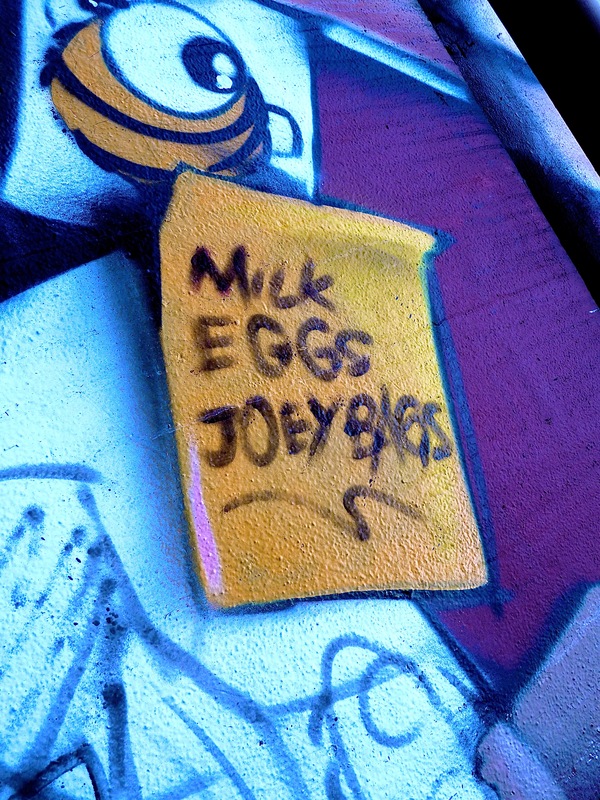 The usual staples procured, bread, cheese, milk, eggs. Pizza and curry on the menu. 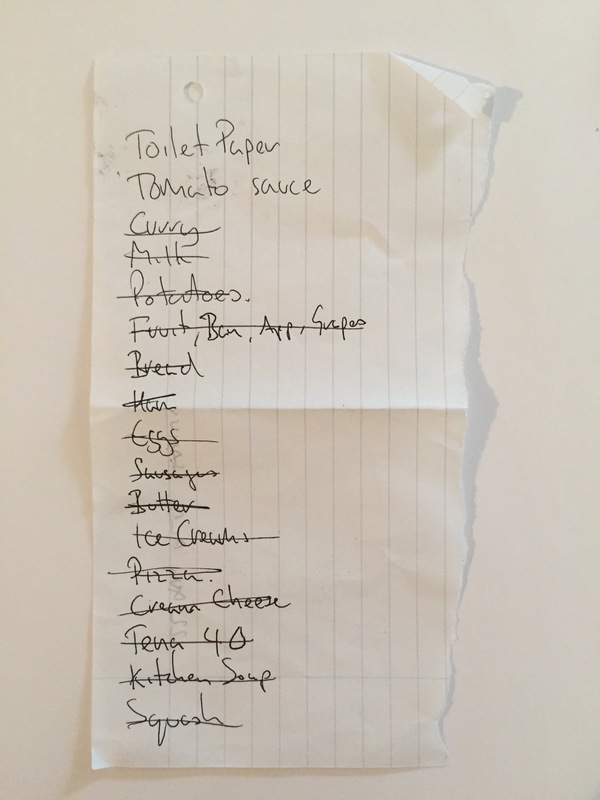 Toilet paper, tomato sauce, curry, milk, potatoes, fruit, bananas, apples, grapes, bread, ham, eggs, sausages, butter, ice creams, pizza, cream cheese, tena 40, kitchen soap, squash. 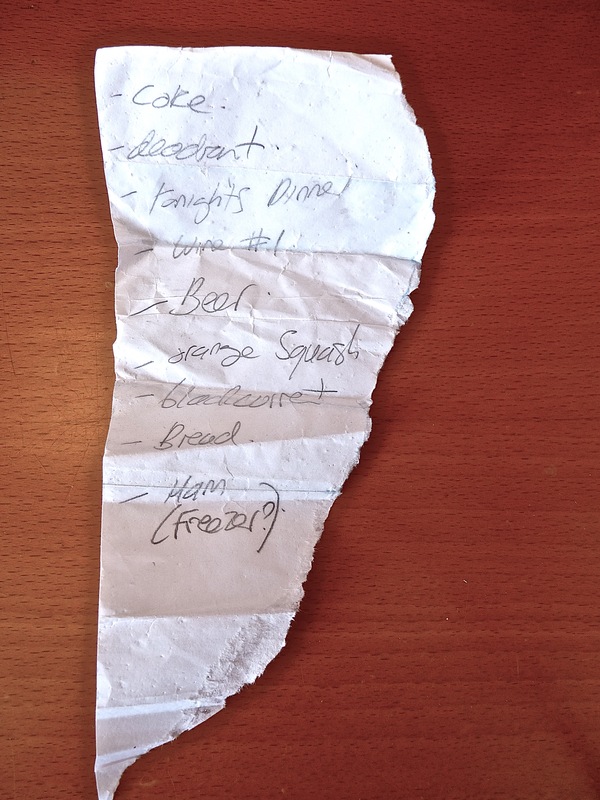 She says she found this list on a passenger walkway at the Port of Southampton. I wonder if this person worked there and was going to do some grocery shopping on the way home but lost the list? The list does seem to be heavily beverage focused. What is wine number 1? Coke, deodorant, tonight’s dinner, wine #1, beer, orange squash, blackcurrent, bread, ham (freezer?). 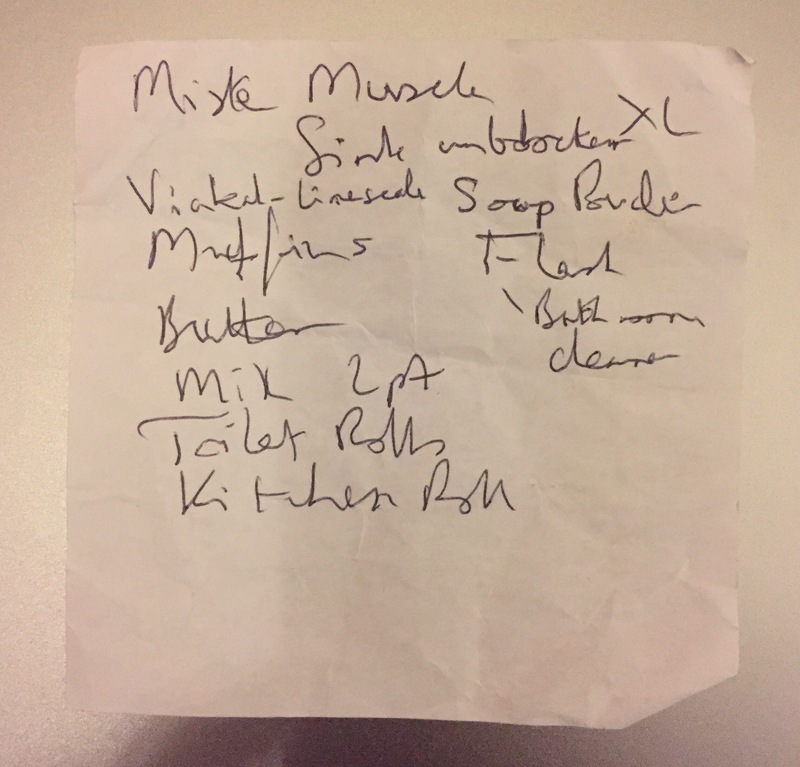 Someone is about to do some seasonal cleaning as these are mainly cleaning items: Mr Muscle sink unblocker, Viakal limescale (remover), soap powder, Flash bathroom cleaner, muffins, butter, milk 2pt (2 pint size), toilet rolls, kitchen rolls.